The city of Toronto is rich with history and beautiful scenery, making it the perfect spot for a romantic getaway. With the wide selection of romantic tours and attractions available, it's the perfect spot for couples to visit. Best Western Primrose Hotel Downtown. This hotel is an excellent choice for a comfortable and relaxing stay. The hotel offers a bar, concierge level, swimming pool, shopping, on-site restaurant, swimming pool, and room service. Bond Place Hotel. This hotel is a first choice for many couples. The hotel offers two excellent on-site restaurants, bellhop services, concierge service, housekeeping, and wake-up service. Rooms offer cable TV, coffee makers, and daily maid service. Delta Toronto Airport. This hotel features amenities such as a fitness center, whirlpool, swimming pool, sauna, on-site restaurant, and room service. Rooms offer coffee makers, cable TV, and free newspapers. Le Royal Meridian King Edward. This hotel was given the seal of approval by King Edward the VII in 1902, and for good reason. The hotel has housed famous celebrities such as Bill Cosby, Wesley Snipes, and Jean Claude Van Damme. The rooms feature remote control TVs with pay-per-view, high-speed Internet access, a mini bar, and bath robes. The hotel itself features bellhop services, florist, fitness center, on-site restaurant and lounge, coffee shops, and concierge desk. CN Tower. The CN Tower offers a variety of restaurants suited to a variety of tastes. The Horizons Cafe offers a relaxing casual dining atmosphere over 1,000 feet above the city. If fine dining is more your style, try 360. This refined establishment offers exquisite cuisine with a 360-degree view of the city. Check CN Tower prices online. Garden Cafe. Located inside the Bond Place Hotel, this restaurant offers an informal atmosphere with quick and friendly service. The cafe serves breakfast, lunch, and dinner, and the food is excellent. Niagara Falls. Take one of the many available tours of Niagara Falls. This beautiful sight is a favorite with visitors across the globe. Approximately 20 million visitors come to see Niagara Falls every year. The Experience Niagara Tour is sure to please. This tour will take you through the stunning Niagara Falls area, including Niagara on the Lake. You'll also be treated to a ride on the Maid of the Mist. This tour boat takes you up close to the breathtaking Falls. A boxed lunch is included with this tour and you will also get free time at the Falls. Niagara Falls Evening Light Tour. Of all of the tours of the Falls, this one has to be the most romantic. The tour will take you through the orchards of the Niagara Peninsula, Niagara on the Lake, and to the base of Horseshoe Falls on the Maid of the Mist. Relax and enjoy the beauty of the Falls as you partake in a buffet dinner in a Penthouse Dining Room. This 80-foot buffet features vegetarian entrees as well as entrees to satisfy the meat lovers. You'll find breads, cookies, fish, pasta, and much more. When dinner is over, for a reduced fee, you can ride 525 feet above the base of the Falls to an observation deck. For those who are timid with heights, you can enjoy the light show from the safety of the ground. On Fridays, there's a bonus fireworks show to enjoy. Grand City Tour and Harbor Cruise. You'll start off with a two-hour tour that will take you to see the CN Tower along with many other area hot spots. You will also see the SkyDome, which is the world's greatest entertainment center with 12.7 acres and a retractable roof. You'll visit Queen's Quay and tour the Toronto Harbor Front. You'll also visit the Hockey Hall of Fame, where you can find hockey artifacts, archives, and collectibles. Then continue the tour with a one-hour tour aboard a sightseeing boat that will take you to see the sights of the harbor and islands. Hop On Hop Off City Tour. 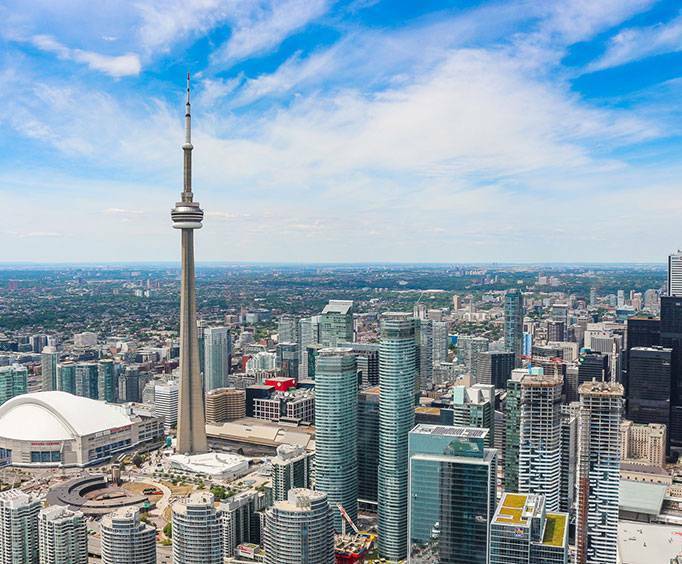 This narrated tour will allow you to explore Toronto at your leisure. You will take either a Double Decker bus or Trolley bus, depending on what time of year you are taking the tour. The buses run a circuit through the city and stop at the area sites and attractions. This tour allows you to get off at any stop and enjoy it at your pace. You can then pick up the next bus at one of the frequent intervals. The Vertical Reality Tour. Hop onto a helicopter and be flown 2,000 feet into the air. Travel at 100 miles per hour as you tour Toronto. The people that run the tour put safety first so you can sit back and relax during the six to nine minute tour. Toronto City Tour. This tour will take you to see the most famous attractions of Toronto. Stops include attractions like the CN Tower, Casa Loma, Harbor Front, the SkyDome, and more. If you're staying at a downtown hotel, they'll even pick you up at the front door. The tour bus was small and gave the driver time to point out the sites and answer questions about the history and things of interest.